On February 27, 2018, the CDLI [Meet Up] hosted the first in a series of conversations on Building and Supporting Community Hubs in Calgary. 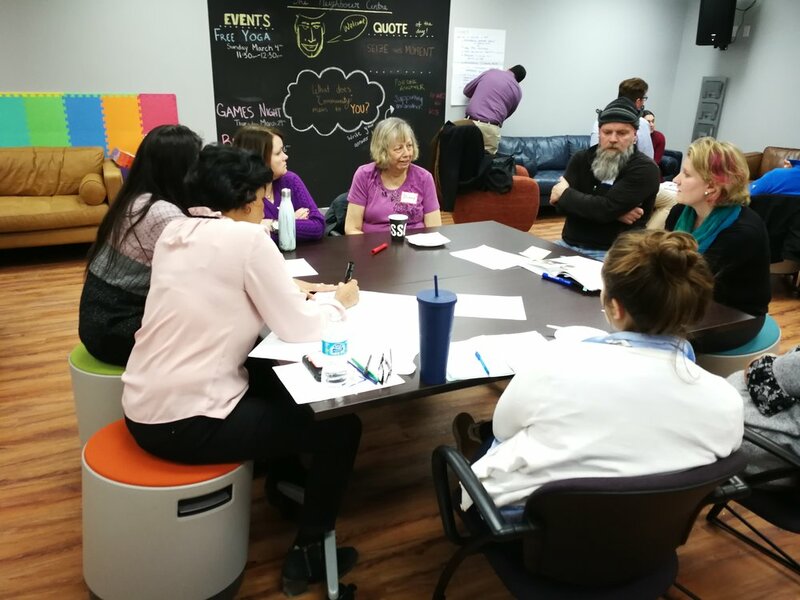 CDLI collaborated with the Community Hubs Collaborative to both introduce and discuss the Community Hubs by Design Toolkit, and other hubs resources, to examine steps to creating and sustaining Community Hubs. Below are some highlights from the group discussions. Build awareness in the community. Know your local community & needs. Spend time at community events, find out what is important to people. Research what are people calling 211 (distress) for. Personal contact with residents (i.e. door knocking) trumps putting up signs & ads. Note: A hub shouldn’t duplicate what’s already there. Provide programming that’s needed – e.g. give people/ especially youth a place to go and have something to do. Conduct community audit/asset mapping of what’s in the community. Don’t reinvent the wheel – speak to those who have tried things in the past. Have programming that applies to all ages, realize that some things like a community garden appeal to different generations. Find and pursue common community goals. Schools could be considered a champion for a local hub. Recognise champions before & after support for initiative is achieved. Find people/entities with common interests and ensure synergies. When building a team, you must include those impacted (i.e. Team = those that live there). Core values helps to create a positive space; engenders humility, diversity and commonality. Visions create buy-in and shared ownership, which is what is needed. Core values grounds you. Values tell you how to get your vision and help to understand the community. Values help you set boundaries, your path & scope. Values help you filter opportunities and find common ground. A wide range of voices need to be represented. There needs to be shared understanding. Define scope/Specify around what you an accomplish together. Buy-in and arriving at commonality, etc. takes patience and time. Start with your goals/ objectives and work backwards. Mutual respect around different beliefs and values. Defining how to come to collective agreement. People cross boundaries over time – clarify around organization/community. Power dynamics could hinder progress. Repurpose existing spaces e.g. libraries, schools, community associations, etc. Focus on making/designing hubs welcoming to all in a variety of ways. Think about proximity to residents, make the distance is walkable. Include programs but also encourage people to ‘stay after’ or ‘linger’ after formal activities. Hub is a reimagining of community centers. A hub is a place where we shift from consumer to ‘active participant’, ‘creator’, ‘contributor’, ‘producer’. The ideal hubs require a mind shift – physical design should reflect this. This needs direction/agreement from YYCCC and both boards of trustees. Learn from other major institutions (other school boards, CPL, etc.). Learn to overcome blocks of practical concerns/ fear of change. Need to know and agree on what are the metrics/measurement indicators. Important to consider what is sustainable in the ethos of neighboring. Iterate through trial & error to get a good starting point. Need flexibility and local responsiveness, troubles by external funding. Think about a successful hubs implication on areas like public health, active citizenship, social capital, etc. Using existing investments: schools, community associations, etc. Schools in particular are under utilized. We have the money, resources and assets need to rethink allocation and mandate. The ‘loitering’ regulations prevents residents gathering. Need to find/know flexibility in existing rules/bylaws via communication & strengthening relationships. Find locations & contexts that are a fit. Ensure good neighbour agreement as this helps.